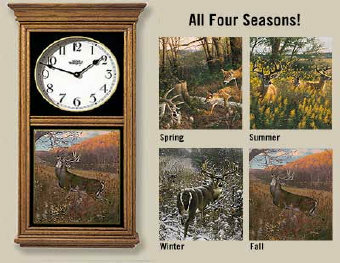 One of our most popular items, these custom-designed clocks are modeled after those originally used for advertising and feature full-color artwork exclusively by the foremost North American Wildlife Artists including Persis Clayton Weirs, Rosemary Millette, Lee Kromschroeder, Michael Sieve, Jim Kasper, Ron Van Gilder, David A. Maass, Marc Hanson and Susan Bourdet. Hand-crafted with traditional medium oak, hand-rubbed finish or ebony finish. Precision quartz movement. AA battery (not included). One-year warranty. 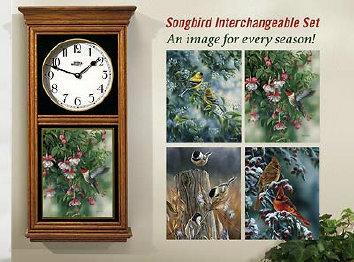 12"W x 24"H x 4"D. There's an image for every taste and season! CHOOSE FROM OVER 35 INDIVIDUAL DESIGNS OR TWO INTERCHANGEABLE SETS!